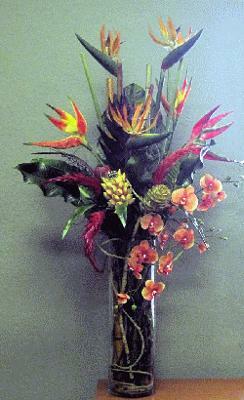 I created this large artificial tropical arrangement using a wide and tall glass cylinder vase. I filled it with vines which helped to place all the botanical components as well as creating a decorating statement. I used artificial birds of Paradise, heliconias, proteas, large tropical foliage, bamboo, pineapple and drooping orchid phalenopsis. Everyone at the office liked it and I got more vases ordered. I would consider this a modern tropical flower design. Join in and write your own page! It's easy to do. How? Simply click here to return to Flower Arrrangement Ideas.